This little puzzle is usually included in beginner magic sets but now you can fool and delight even the most experienced magician with this classic apparatus and some easy but little known moves. 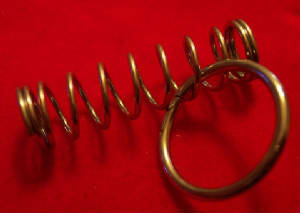 The Basic effect is showing the spectator that the ring can be placed on the spring and easily removed. The magician then hands the parts to the spectator who cannot remove the ring. The magician takes the ring and spring back and instantly removes the ring. No additional supplies, no hiding or behind the back moves, the secret is so subtley perofmed that even the trained eye cannot detect it. There is even a magicians move where those who know the secret cannot remove the ring. You get 2 ring and spring sets and a DVD for $10. Shipping is FREE for a limited time.